On 14 June, forces under the command of Ibrahim Jadhran attacked and took control of Sidra and Ras Lanuf oil ports from Khalifa Haftar’s Libyan National Army (LNA) forces. Large LNA units are currently being deployed to Brega and Ajdabiya for the counter offensive. On 2 May, Islamic State fighters attacked the HNEC building in the Ghout al-Shaal area of Tripoli. As many as 16 people were killed and more than 19 were injured. On 5 May, ISIS claimed its fighters undertook two attacks on the LNA in the Wahat province in late April. On 8 May, ISIS undertook an SVBIED attack on an LNA controlled checkpoint near Bin Jawwad 70 km from Ras Lanuf, killing two and injuring four. ISIS media claimed responsibility for a car bomb attack on a Libyan National Army (LNA) checkpoint at the entrance of al-Nawfaliya town, on 31 August. 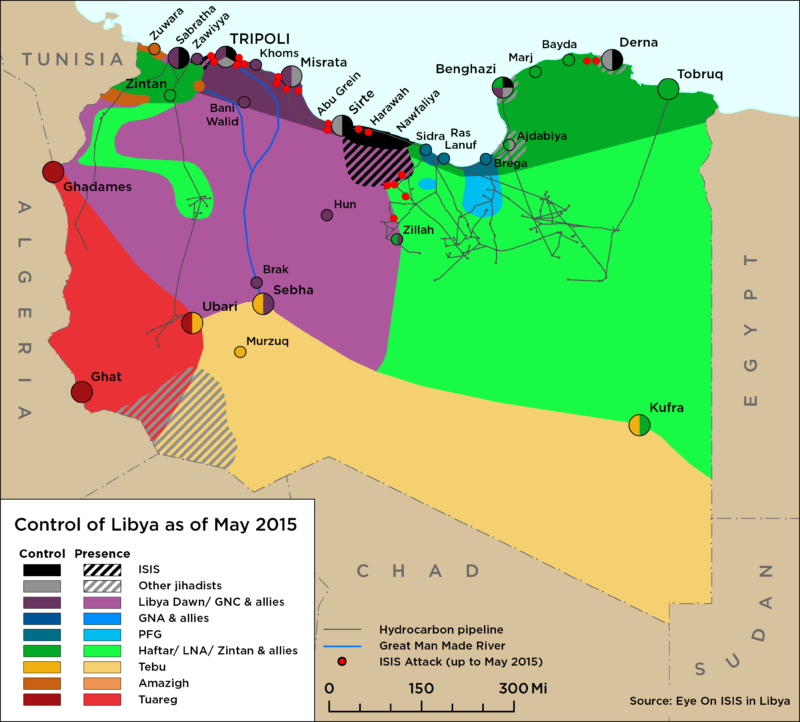 It was reported that ISIS units moved in to al-Teysseen, a town 90 kms east of Sirte, on 1 September. They allegedly held an Eid prayer in the local mosque and took positions in the town. The LNA air force launched a series of airstrikes targeting ISIS positions, from Ras Lanuf airstrip on 2 September. Local sources in Jufra report a new mobilization by GNA/Islamist affiliated groups who reportedly plan to attack Ras Lanuf port in the coming weeks. Rivalries between militias of various factions in Tripoli are escalating, with various rival armed groups implicated in clashes, kidnappings and armed assault. The anti-ISIS coalition, such as exists, is in a state of flux after Haftar’s seizure of the oil ports. Misratan officials have said that they will not go to war against the LNA to support Jadhran, however after Haftar’s forces succeeded in repelling a counter attack against the Sidra and Ras Lanuf ports, they pushed to within 50km of Sirte where Misrata are currently battling ISIS. 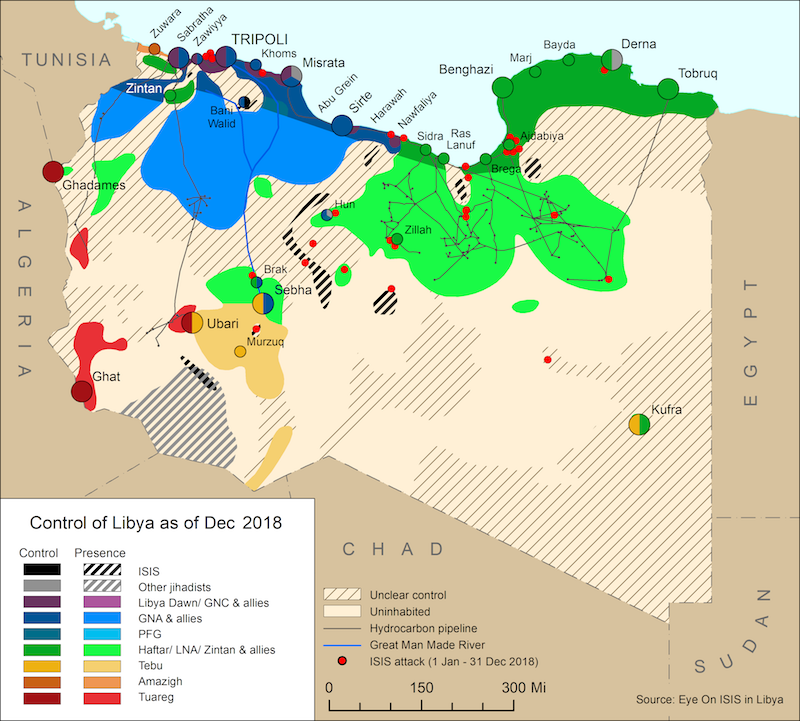 On 11 September, General Khalifa Haftar’s Libyan National Army (LNA) announced and launched a secretive military operation named Sudden Lightening, and by 12 September the LNA had taken full military control of the Oil Crescent. Ras Lanuf, Sidra and Zuetina oil ports were wrested away from Ibrahim Jadhran’s Petroleum Facilities Guard (PFG), and are now under control of the House of Representatives-aligned (HoR) LNA. On 2 July, the internationally-recognised National Oil Corporation (NOC) declared force majeure on crude exports from Zueitina and Hariga oil ports. The NOC’s latest move comes in response to the Libyan National Army’s (LNA) decision on 25 June to transfer control of the Oil Crescent oil ports to the parallel Benghazi-based NOC. On 25 June, the LNA spokesperson Ahmed al-Mismari stated that Khalifa Haftar had ordered that the all ports ‘liberated’ from Ibrahim Jadhran forces on 21 June by the LNA were to be handed over to the Benghazi-based National Oil Corporation, under the auspices of the Bayda-based parallel (interim) government led by Abdullah al-Thinni. On 10 September, the commander of the LNA’s Sirte Operation Room declared that the entire coastal strip from Sidra to about 50km east of Sirte. On 8 September, the LNA reportedly defused a bomb attached to the main gas pipeline south of Ajdabiya. BM forces are positioned at the 30km checkpoint east of Sirte, and it is reported that BM arrested two people in a raid last week, fueling tensions with the local population. On 18 March, the LNA announced it had fully liberated Ganfuda from jihadists and began targeting Sabri and Souq al-Hout. The LNA has also retaken the Oil Crescent and on 20 March, pushed further south. On 14 March, the LNA launched a counter attack against the BDB. Following intense fighting, by the end of the day the LNA claimed to be in control of the Oil Crescent once more, including the oil ports. The Islamist Benghazi Defence Brigades launched a surprise attack against the LNA in the oil crescent last week, pushing the LNA back to Brega and taking control of two oil ports. The LNA has accused the PC of working with BDB and other jihadists to mastermind the attack.